Wolf spiders can be found all over the world. They are a hearty family of arachnid, and can survive in nearly any climate, from the Amazon to north of the Arctic Circle! They range in size from 1/2 inch to 2 inches, including the legs, and are usually brown or gray in color. They also happen to be very low-maintenance pets. Wolf spiders do not spin webs, which means they do not need a lot of space for housing. A 2.5-gallon aquarium/terrarium provides plenty of room for a single wolf spider to build its home. Instead of building a web, your wolf spider will make its home in a hole in the ground. Give her an inch or more of clean, pesticide-free soil and some leaves, small rocks or twigs to hide under. (Artificial plants and rocks like those you get from pet supply stores will work just fine.) Also, make sure the lid to your spider's tank is ventilated, but escape-proof. Although they are diurnal, wolf spiders prefer the darkness, so you will not need any kind of special lighting. A daily misting will help keep your pet's home comfortably humid. Now that you've got your pet wolf spider suitably housed, you're going to want to make sure she's fed. Wolf spiders, as you probably expect, mostly eat insects, worms or just about any living thing that is small enough to catch and eat. They will also eat small lizards, frogs and even very small birds. 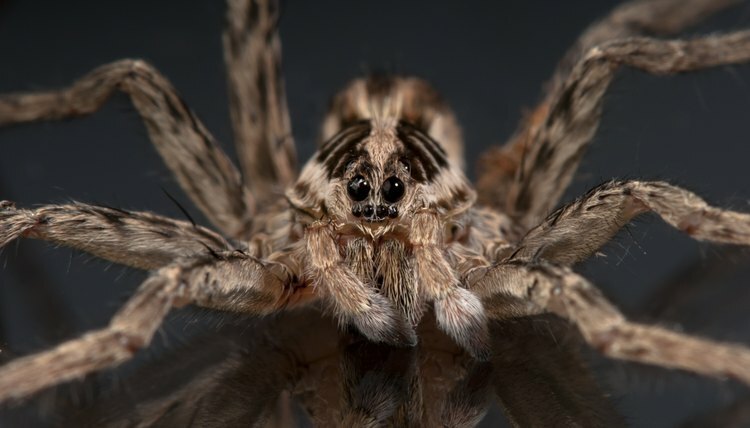 Most wolf spiders will only need to eat once every two days. Large specimens may need to eat daily. Either way, choose something about half the size of your wolf spider. You can catch a fly, worm, grasshopper or pretty much anything small enough for the spider to eat in your backyard. Make sure your spider's food cannot harm her. For example, anything with a stinger, like a bee, or a venomous animal, like a centipede, is not good food for a wolf spider. Do not leave the prey in your spider's enclosure for more than a few minutes, to avoid the possibility of the prey injuring your pet. Wolf spiders are wild, so don't expect to handle your spider more than is absolutely necessary. She may bite, and although wolf spider venom is only harmful to humans who are allergic, the bites can be painful. Wolf spiders can live 3 years or more, depending on species, and have no real health concerns, as long as they have a healthy habitat and proper feeding. What Kind of Spiders Do Mud Daubers Eat?